Stuart May was killed in an apparent hit and run while riding his bicycle near Covelo. UPDATE 8:50 a.m. -- The Mendocino County Sheriff's Office has released the name of the bicyclist killed in an apparent hit-and-run near Covelo. The body of Stuart May, 66, was found on Monday evening, near his damaged Huffy bicycle, a few miles northeast of Covelo, on Mendocino Pass Rd. (Hwy. 162). The California Highway Patrol conducted a preliminary investigation. Now the sheriff's office is asking for the public's assistance in providing any information about May's residence, or recent activity, as part of the investigation. Though May had been living in the Covelo area for around a year, they have been unable to determine his actual residence. Anyone with information can call the MCSO at 707-463-4086 or the coroner at 707-463-4421. Synopsis: On 1/21/2018 around 6:21 PM the Mendocino County Sheriff's Office was dispatched to the 26000 Block of Mendocino Pass Road in Covelo regarding a Coroner's Investigation. 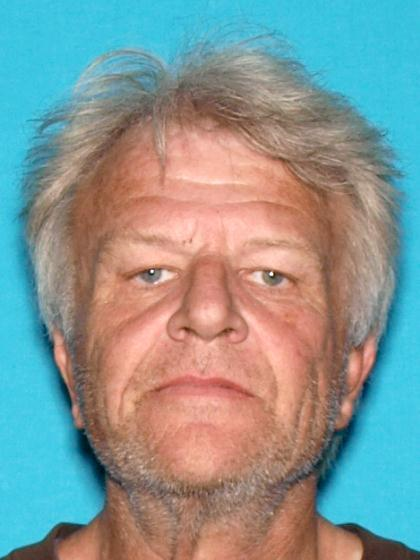 Upon arrival the Investigating Deputy was informed by the California Highway Patrol that an adult male, later identified as Stuart May, 66 years of age out of Covelo, was deceased. The investigation revealed that an Officer of the Round Valley Tribal Police was patrolling the area when he noted a damaged bicycle laying along the roadway. The Officer stopped to investigate and found the decedent laying to the side of the roadway. The preliminary CHP investigation indicated the damage to the bicycle appeared to have been caused by a vehicle collision and that agency initiated a felony "hit and run" investigation. The Mendocino County Sheriff's Office was able to determine the decedent may have been living in the Covelo area for a year or more but was unable to locate his residence or where he has been living. The Sheriff's Office is asking for the public's assistance in locating the decedent's residence as well as assisting the California Highway Patrol in reconstructing the decedent's recent activity as part of their investigation. Anyone with information is asked to call the Mendocino County Sheriff's Communications Center at 707-463-4086 or the Coroner's Division at 707-463-4421. WILLITS 1/22/18 -- A male bicyclist was killed in an apparent hit-and-run on Hwy. 162, east of Covelo, on Monday. The deceased's name has not been released, nor his age or any other details, except that he was riding a Huffy bicycle. The body was found about 3 miles past Covelo, where Hwy. 162 becomes Mendocino Pass Rd. There is currently no publicly known primary suspect. The California Highway Patrol is investigating the incident and asks that anyone with information on the hit-and-run contact them at (707) 923-2155. On January 21, 2019, at approximately 6:02PM, an officer with the Round Valley Tribal Police was driving on SR-162 (Mendocino Pass Road), when he noticed a bicycle on the shoulder which had collision damage to it. The officer stopped to investigate and found the male rider, deceased near the bicycle. Officers from the California Highway Patrol were summoned to the scene and determined that the bicyclist was struck by a vehicle, which subsequently fled the scene. The suspect is believed to have fled the scene, eastbound on SR-162 (Mendocino Pass Road). The California Highway Patrol is investigating the collision. Deputies from the Mendocino County Sheriff's Office responded to handle the coroner's report. Personnel from Cal-Fire and the Round Valley Tribal Police assisted with the scene. The California Highway Patrol is requesting the publics help in finding the driver and involved vehicle. If anyone has information regarding the identity of the driver or the vehicle, please contact the California Highway Patrol, at (707) 923-2155.